Shaik, A.U.R., Biswas, H. and Pal, S. 2017. Increased CO2 availability promotes growth of a tropical coastal diatom assemblage (Goa coast, Arabian Sea, India). Diatom Research, https://doi.org/10.1080/0269249X.2017.1379443. Writing as background for their work, Shaik et al. (2017) note that marine diatoms "contribute one-fifth of the global primary production," possessing effective carbon concentrating mechanisms (CCMs) that "enable them to fix carbon efficiently, even at present [low] CO2 levels." Consequently, it is believed that rising atmospheric CO2 concentrations (i.e., ocean acidification) will enhance the ability of diatoms to fix carbon by increasing their photosynthetic rates and growth, as these marine phytoplankton will experience energetic savings via the downregulation of their energy-consuming CCMs at higher CO2 levels. And so it was that the team of three researchers set out to determine the correctness of this theory in three separate laboratory controlled experiments. Each experiment included diatoms that were collected from the Arabian Sea, off the coast of north Goa, India. In the first experiment, initial CO2 concentrations were set at approximately 330 and 1000 µatm pCO2. In the second experiment they were set at approximately 400 and 1000 µatm, and in the third study at approximately 240 and 775 µatm. Following two days of incubation under these conditions, the first and third experiments were ended and several growth-related parameters were measured. The second experiment lasted much longer, in which the diatoms were maintained for approximately 28 generations. Not surprisingly, the seawater pH in each of the experiment incubations increased by the end of the study periods due to diatom photosynthesis, the latter of which parameter was enhanced under elevated CO2. Elevated CO2 (i.e., ocean acidification) also proved beneficial by enhancing the diatoms' growth rate and Chla cell concentrations in each of the three experiments. In addition, the authors report there was no significant effect of elevated CO2 on phytoplankton community composition. Consequently, Shaik et al. write in conclusion that, given the significantly positive responses observed in their analyses, the natural phytoplankton community will likely "benefit and exhibit higher growth" from any future decline in seawater pH, be it of natural or anthropogenic origin. And that could have incredibly positive impacts on higher organisms within the food chain that rely upon these key primary producers. Figure 1. 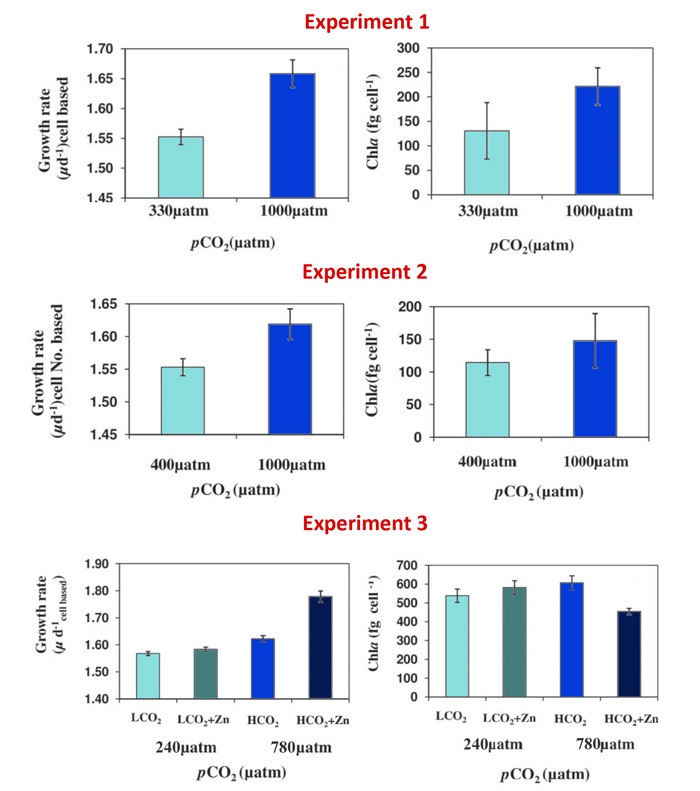 Growth rate (left panel) and Chla concentrations per cell (right panel) of a natural diatom phytoplankton community exposed to two different experimental CO2 levels in three separate experiments (described in the text above). Adapted from Shaik et al. (2017).